What fun a kite is on a breezy spring day! Many a child has felt the strength of the wind tugging at a kite, has known the joy of flying a colored sliver of joy in the bright blue of a summer sky. Kites have been around for centuries and they have been more than toys. Scientists have used kites to study, to invent, to explore, to work, to capture and to probe the unknown. In 1883, Douglas Archibald used a kite, to which he had attached an anemometer, to measure wind velocity. Leonardo DaVinci attempted to use kites to cross water for the building of bridges. Later, Homan Walsh, a 10-year-old boy, used a kite to reach across the chasm of Niagara Falls. The kite pulled a cable that was the beginning of the building of the great span. For the performing of this feat, Homan was paid a hefty sum of ten dollars! Ben Franklin used a kite in his studies of lightning. He flew kites in thunderstorms to discover the facts that he needed. He was eventually able to prove that lightning was electricity. Orville and Wilbur Wright used kites to help them learn the method of flight and to develop an airplane that could support a man's weight and remain stable in the sky. Guglielmo Marconi used kites to carry an antenna high enough into the sky to allow him to send a radio signal across the Atlantic Ocean in 1901. Kites have also been used to send messages in war. In the early 1900's, the United States Weather Bureau used kites extensively to help take readings with instruments to help forecast the weather in the US. Alexander Graham Bell, who we all know for his work with the deaf that led to the invention of the telephone, used kites to help him develop aircraft. He made a new improved Hargrave Kite (a Box kite) and used this work to design a number of successful aircraft. During World War II, Paul Garber designed an Eddy type kite that was used for gunnery target practice and thus saved many lives during that conflict. He was only one of the many scientists and inventors who made use of the kite. It may be possible for you also to learn from the kite and to have a load of fun on the side. So let's take to the air. First we will need a definition for the kite. A kite is a frame made of wood or lightweight plastic, covered with cloth or paper that is flown on a string, with a tail or a bridle for control. Start your study by making a notebook to keep your info in. Decorate the front of the binder or presentation folder with drawings of brightly colored kites in a summer sky. Collect pictures of different kites for your folder. If you can't copy or cut out the pictures, try drawing some. Now let's read up on the subject. Here are some books on kites. Easy to Make Decorative Kites – Nine Models From Around the World By Alen and Gill Bridgewater. Choose one of the scientists or inventors listed above and study their work with kites more fully. Prepare a report on the person and be sure to include photos or sketches. There are many persons who have made history using kites. Choose five of these names and research to find what contribution each made to the science of kiting. Peter Lynn, Eddy, Homan Walsh, Domina Jalbert, Eric Muhs, Samuel Cody, George Pocock, Fran Rogallo. Write a poem about kites. Make your poem in the shape of a kite with a tail. Be creative. 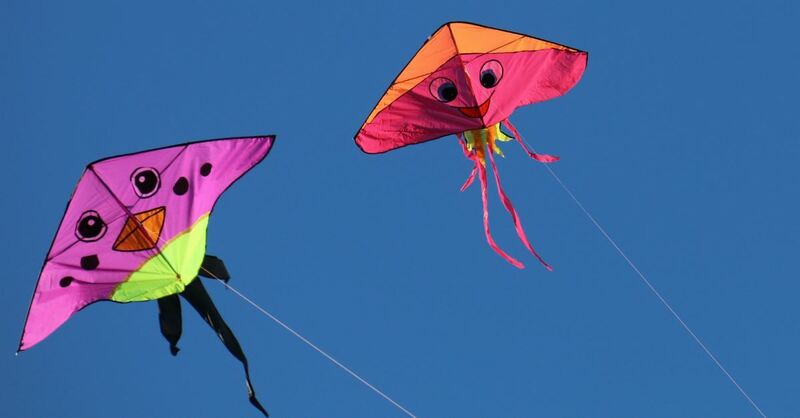 What does the Bible teach about kites? Nothing? Think again. Use your Strong's Concordance to look up two verses about a bird called a kite. There are many verses that are about flying. There is a verse about witty inventions. Everything that man thinks he has learned on his own is explained in the Bible. Find five verses that relate to this study and copy them into your notebook. Draft a time line of kite history. Plan a kite flying event. Choose a site with plenty of room away from power lines and trees. Send out kite shaped "flyers" inviting people to your kite flight. Ask them to bring picnic lunches and lawn chairs or quilts to sit on and, of course, kites. Present prizes or certificates for the highest flyer, the best controlled, the prettiest, the most fun, most unique, most complicated, largest, smallest, etc. Make a copy of the Beaufort Wind Chart that was devised in 1805 by Admiral Francis Beaufort of the British navy. Make a kite safety poster to put up at the public library or an elementary school in your town. Make it bright and easy to read and understand. Make your poster answer this question: When and where is it unsafe to fly a kite? One of the least familiar styles to Americans is the Box kite. Understanding how this kite flies will help you to understand many of the physics behind how things fly. Usborne's Pocket Scientist Flight and Floating explains, through simple hands-on activities, the forces of flight. Study the control surfaces of a kite. Compare tethered flight to free flight. Compare Newtonian lift to Beroulli lift. Compare gliding to powered flight. What provides stability to a kite? What ideas for using kites can you come up with? Sketch kites in your notebook - different shapes, colors, sizes and designs. Describe what use the kites will be put to and how they will work. Through the ages kites have provided more than amusement and entertainment for adults and children alike. They have been used by scientists, spies, sailors, meteorologists, explorers, messengers, inventors, researchers and even by artists. Elece Hollis is a freelance writer and stay-at-home mom. She and her husband Ron of 30 years have 7 children and are in their sixteenth year of homeschooling. They live east of Okmulgee, Oklahoma and south of Tulsa on a 40 acre pecan farm.